Windows 8 pre-release development builds that been leaked before the official beta, i.e. Windows 8 M1 Build 7850, Windows 8 M2 Build 7955 and Windows 8 M3 Build 7959, contains more and more watermarks on desktop. In addition to usual “for testing purpose only” with build number watermark on the bottom right corner, a hash code has been added to the watermark, plus a “Microsoft Confidential statement which promised leakers will get sacked. Unauthorized use or disclosure in any manner may result in disciplinary action up to and including termination of employment (in the case of employees), termination of assignment or contract (in the case of contingent staff), and potential civil or criminal liability. Note that the “shhh… let’s not leak our hard work is not a watermark. It’s part of the desktop background wallpaper. To remove all these watermarks for a clean desktop, there is a tool which does all the dirty jobs. Named as Universal Text Remover and developed by chbaldo, it can patch the system files to remove the all the watermark text that appears on the Windows 8 desktop, including the Microsoft Pre-Release Windows Operating System, evaluation or testing purpose notice, build string, installation hash, and the Microsoft confidential message. It supports uninstallation too, i.e. to put back the watermark onto desktop. Download Universal Text Remover from MDL Forums. Run the program as administrator in order to work. The Universal Text Remover currently only works on Windows 8 M2/M3. Copy the %WinDir%\System32\shell32.dll file to another folder location (e.g. Desktop) for editing. Run a HEX Editor (e.g. XVI32 or HexEdit). Open the copied shell32.dll in the HEX editor. Replace the 34 in the HEX code with 35. Take ownership and grant full control permissions of %WinDir%\System32\shell32.dll. Rename the shell32.dll to shell32.dll.old. Copy the patched shell32.dll into the %WinDir%\System32\ folder. Shutdown Windows and boot from a Windows 7 or Windows 8 installation DVD or ISO. Select “Repair your computer”, select the Windows 8 installation, and then open “Command Prompt” window. Use the “copy” command (e.g. copy shell32.dll %WinDir%\System32\) to copy the file over. Type Cmd into Start Search, right click on the Cmd and select Run as Administrator. Type mcbuilder.exe and press Enter to rebuild MUI cache. To remove the rest of the watermarks, use the simple tricks that take advantage of multi-language support. Microsoft inserts the text of the watermarks in shell32.dll.mui file for Windows 8 (in Windows 7 and Windows Vista, it’s user32.dll.mui). By removing such texts, the watermark will be removed too. Copy the %WinDir%\System32\en-US\shell32.dll.mui file to another folder location (e.g. Desktop) for editing. Run a Resource Editor (e.g. Resource Hacker). Open the copied shell32.dll.mui in the Resource Editor. Go to String Table -> 2070 -> 1033. 33110: For testing purposes only. Note: In Resource Hacker, the string value is enclosed in quotation marks. Go to String Table -> 3876 -> 1033. 62000: Unauthorized use or disclosure in any manner may result in disciplinary action up to and including termination of employment (in the case of employees), termination of an assignment or contract (in the case of contingent staff), and potential civil and criminal liability. Compile the script (if applicable) and save the file. Take ownership and grant full control permissions of %WinDir%\System32\en-US\shell32.dll.mui. Rename the shell32.dll.mui to shell32.dll.mui.old. Copy the edited shell32.dll.mui into the %WinDir%\System32\en-US folder. Shutdown Windows and boot from a Windows 7 or Windows 8 installation DVD or ISO. Select “Repair your computer”, select the Windows 8 installation, and then open “Command Prompt” window. Use the “copy” command (e.g. copy shell32.dll.mui %WinDir%\System32\en-US) to copy the file over. The steps too troublesome? Here’s a command-line batch script that does ownerships taking and files replacement automatically, yet allowing you to inspect the content of the files. 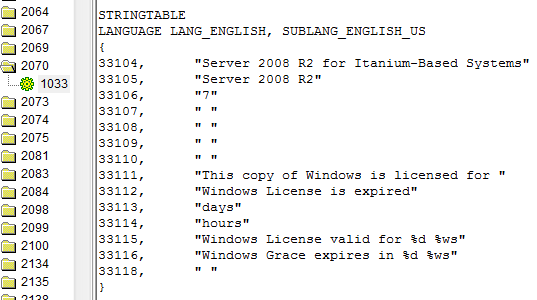 The ZIP package contains the already patched shell32.dll and shell32.dll.mui from Windows 8 Build 7955. Run the Remove-Win8-7955-Watermarks.cmd as administrator.